Lately, c-dramaland is filled with reruns on TV which leaves us with only a handful of dramas on the weekly list. 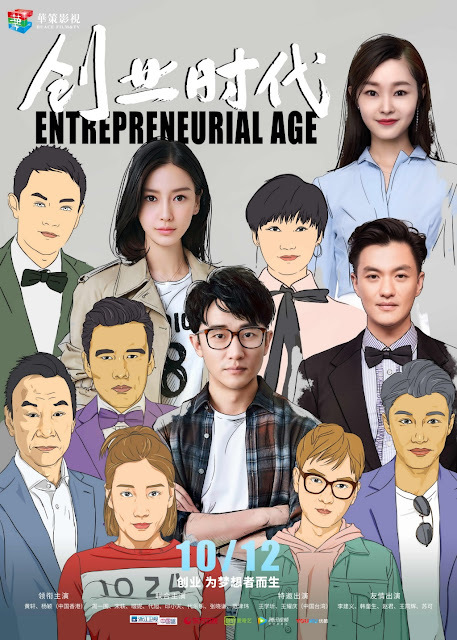 Entrepreneurial Age starring Huang Xuan and Angelababy replaced the time slot taken by Age of Legends. It premiered last Friday to extreme lows of 0.2%/0.3% (0.26%/0.49%) according to both CSM52 Cities and CSM Nationwide. Mother's Life continues to lead while The Years You Were Late which airs on Hunan TV continues to lag. The latter had a shorter week due to the Golden Eagle Awards. 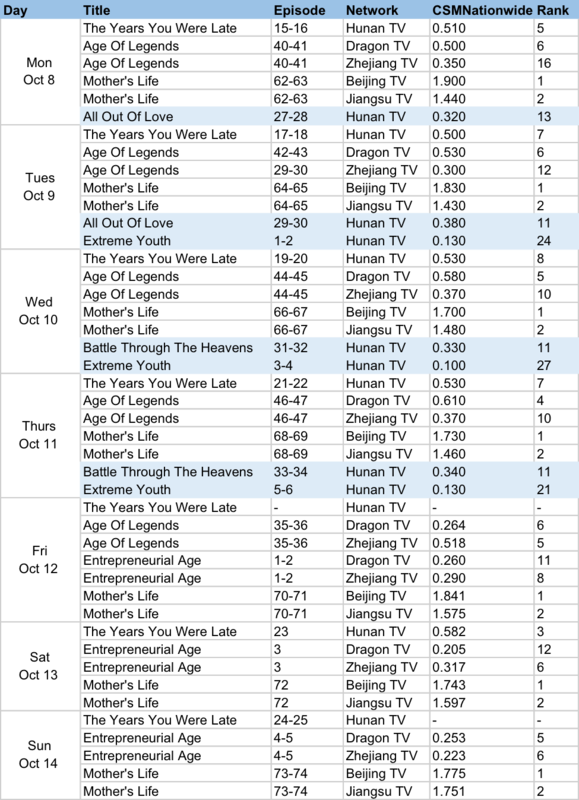 Extreme Youth which is a new car racing drama led by Elvis Han premiered on the 10pm slot, yet it seems to be suffering the same fate with CSM52 ratings at 0.3% and CSMNationwide at 0.1%. While Ruyi's Royal Love in the Palace retains the lead in web rankings, a number of dramas shifted places within the top 10. Age of Legends and Mother's Life moved up to second and third place. After months in the top 10, the summer hit drama Ashes of Love is replaced by Martial Universe Season 2. I've watched Entrepreneurial Age (6 episodes already streamed on YouTube) and I actually like it. They are not subbed yet and I can't speak Mandarin, but with the help of synopsis, it's pretty easy to get the gist. Great cinematography too, esp when Huang Xuan's character travels to Tibet. Shame that it didn't start out well rating-wise, but perhaps it's because people already prejudged Angelababy's acting? She's okay, not fantastic but not like a sore thumb either. Huang Xuan is very enjoyable though, and Zhou Yiwei is solid as expected. Well AB just doesn't seem to fit the cooperate investor type of role. She did a serviceable job w/ Wallace in that period drama which I can't recall the name. Here, just as wooden as ever. Maybe once the OTP meet, there'll be more to look forward to? The story is nothing compelling, it just doesn't drawn you in. Wow wow wow, it is just amazing and even ridiculous how strong hate and love for certain idols are these days. If you're being loved, you'll be loved to death no matter what you done. If you are hated, no matter what you'll be hated. ABB was being bashed so so bad, each and every single person hate her acting to the point I decided to go check out Entrepreneurial Age, not my genre at all. It is a bad and boring story but there was nothing wrong with ABB acting. People were saying "wooden, emotionless, expressionless, etc." so I thought she was going to play a big poker face who is robotic and ignorant...well, turns out she played as a really realistic person and did well. Now I believe the big hate in her, is just in her background, she is really rich. Getting opportunities other idols wouldn't get maybe. And people believe she is plastic surgery. Just because somebody is plastic surgery doesn't make them bad acting. Being able to be on variety show means she is a really real person and DOES have good acting skills. People yell at her in the worse way ever, in hopes of being able to kick her out of acting. I will be honest, I am not lying a bit at all, I'd encountered at least 3 or 4 people in my life where their face totally changed because of braces. Their teeth were so bad so their jaws do change a whole lot, which ABB really did have very bad teeth to get a believable big transformation. At least, braces is much more believable than other women who transformed TREMENDOUSLY from really wide faces into really long faces vice versa through aging and weight loss? Never seen that before. And it is not as if their acting were much better than ABB. Same level or worse. I am not ABB fan but it's so ridiculous how people bully her online all the time and she never do anything about it. Does anyone know if HXM got hate because of marrying her? He used to be so famous, I saw Royal Tramp and Summer's Desire that were so terrible but I don't think that would make him get hated so terribly...ROCH and The Bund was still pretty good in the least. I'd only seen ABB in Love You You and it was not bad. People liked her at that time too, until that plastic surgery thing came up then they denied her ever good at acting. You are My Sunshine and Bride Wars (stupidiest storyline ever) were not bad either! In terms of acting. She is pretty but I don't think she is even that pretty for people to be jealous as a possibilty...it's probably her background for the most part. Sorry for long post, it's because the strong hate towards her and HXM are just tremendous.